I’m going to assume that you, like me, also know very little about this region. It is worth a visit, and not simply for the legendary Canadian congeniality and hospitality (though you will find the full panoply of both on display). Here are my observations, but I can not possibly include everything; we visited a range of wineries and the winemakers were extraordinarily generous in what they chose to pour. If you do happen to know anything about Canadian wine, I’m guessing your experience is likely the same as mine: You knew of the cult ice wine produced by Inniskillin. The irony is that the wine that has become perhaps the most successful and well known from this region may actually be doing more harm than good to the region’s reputation. 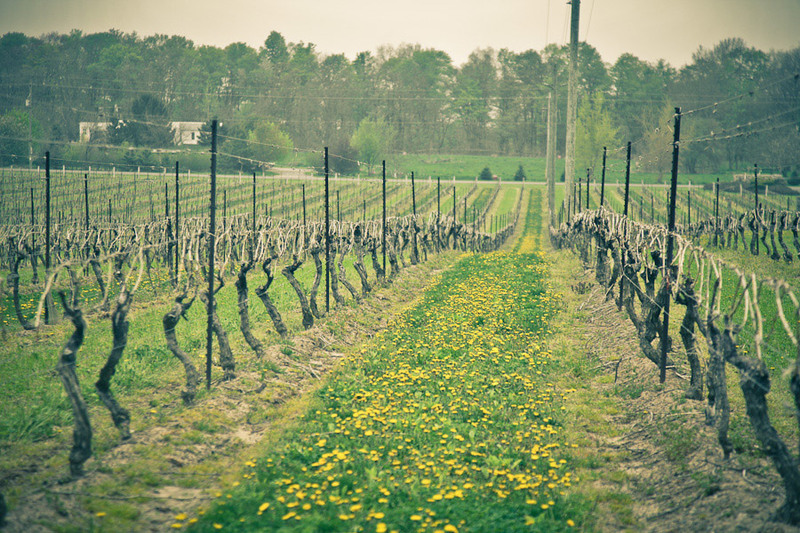 St. Urban Vineyard, at Vineland Estates, one of the oldest in Niagara. It produces remarkable, ageworthy rieslings. That’s because ice wine creates an impression for wine consumers, and it’s easy to extrapolate in Canada’s case. Northern region, country with lots of snow, wine with the word “ice” in the description. I arrived at TasteCamp open-minded, but just about everyone I spoke with told me they figured Canada was good for “making wine in extreme climates,” the most logical of which was an ice wine. If Niagara were instead known for the Bordeaux blends produced at Chateau des Charmes, our first stop, the region’s reputation would be entirely different. We tasted several red blends at CdC that were tannic monsters. I don’t mean this in any sort of context, either; they would be considered strongly tannic in any region in the world. Dark, dense, structured, these Canadian wines made an immediate impact on anyone who expected waves of ice wines and cool climate varieties. The growing season in Niagara varies by sub-appellation, with Niagara-on-the-Lake offering the warmest home for vines. It’s closer to Lake Ontario and enjoys a longer growing season with more potential for ripening. It’s a cool climate, but not extremely so, and red varieties can thrive here. It’s no surprise that vintage variation is much more, well, varied in Canada than in many wine regions. 2007 and 2010 offered growers and winemakers the kind of season that many warmer climates typically enjoy. 2008 and 2009 were much more of a struggle in general. So when we sat down for lunch at Chateau des Charmes, we had an immediate opportunity to find out just how big Canada could take it. Turns out, just about as big as they want. The Chateau des Charmes 2007 Equuleus, a Bordeaux blend, is loaded with more than just vowels. It’s thick, almost fat, and boasting the kind of structure that will unwind slowly over many years. I found myself wanting to grab a bottle for a future blind wine night with friends. Given 25 guesses, Niagara would still not come to mind. Then we were presented three barrel samples from the prodigious 2010 vintage. All were bound for the Equuleus bottling, but they showed varying levels of new oak. The sample with neutral oak was easily the most complex, allowing pure fruit to show muscle and grace. Unfortunately, most writers and the folks from Chateau des Charmes clearly favored the sweet heavy tones of new oak. Proprietor Paul Bosc, Jr. spoke about the assumptions and bias that his region must face. He is clearly proud of the Equuleus bottlings, and understandably so. But these wines show an outsized proportion and lack the elegance that could make them great. It seems that a young region naturally wants to prove doubters wrong—”We can make a big red!”—and that’s where wines like Equuleus come out. The throttle is out, the fruit is massive, the tannins obtrusive. They are linebackers, hitting hard but not exactly graceful dancers. I have no doubt that this will change, and I am impressed with the power potential in Niagara-on-the-Lake. Producers like Chateau des Charmes can, in good vintages, create special wines that need not be deemed inferior to any region. 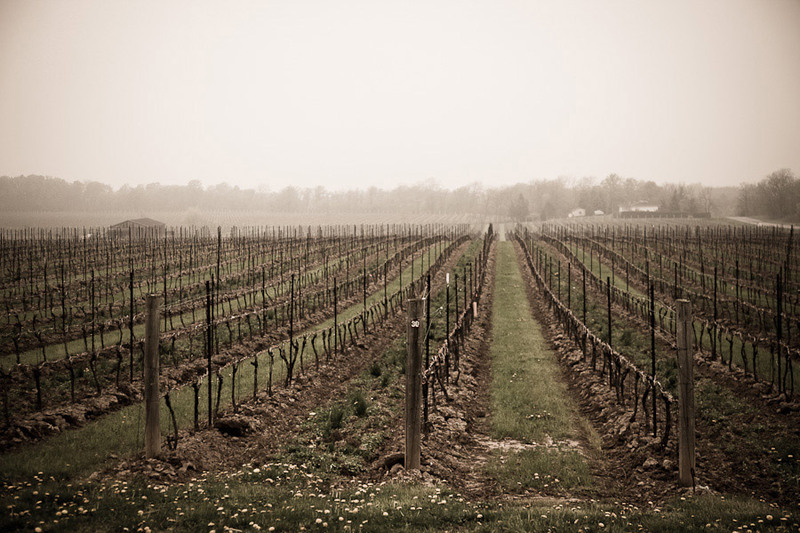 Drive west and you’ll arrive at the Beamsville Bench, a cooler part of Niagara with more diverse topography than the relatively flat Niagara-on-the-Lake. The Bench features dips and dives in the land. Appropriately, many producers here eschew Bordeaux varieties in favor of pinot noir, riesling, gewürztraminer, and chardonnay. We enjoyed a fascinating stop at Tawse, where winemaker Paul Pender explained why they’ve decided to employ biodynamic growing practices. Pender showed us the clover that serves as a nitrogen-rich cover crop, and he took us through a tasting of wines from different sites to show off the terroir. Still a young region, Niagara clearly offers sense of place in its best wines. Pender’s two oaked Chardonnays were by far the most compelling Chardonnays we tasted over the weekend; they were sleek, complex, and integrated, a stunning contrast to the ocean of over-oaked, popcorn-scented Chardonnay that seems to plague Niagara in the same way it plagues other wine regions. (I confess to being a Chablis lover, and I’m told Niagara produces quite a bit of unoaked Chardonnay, but most winemakers chose to feature their oaked versions for TasteCamp.) And the Tawse Pinot Noir lineup offered a selection of bottlings that evoked soil and herbs to cut the rich cherry notes. Tawse is only six years old, but Pender is already achieving great things there. After a series of disappointing Rieslings from Niagara-on-the-Lake, the variety found its stride out on the Beamsville Bench. The single-vineyard bottlings from Thirty Bench Winery were outstanding, eclipsed only by the fanatically focused Rieslings at Vineland Estates. Winemaker Brian Schmidt could not possibly suppress his passion for Riesling if he tried. He has the luxury of working for a winery that has kept a library dating back to the early 1980s, and Schmidt could not help himself: he knew he was in the presence of wine geeks, and he obviously loves to open mature bottles for those who will appreciate it. While the 1998 Riesling seemed, to me, as if it was well past its prime, the 1989 was a stately beauty, opulent and riveting. Schmidt’s Rieslings from the past five years are world-class, thoughtfully made to reflect each vintage. The 2010 Rieslings might be his best yet. And a tasting of Vineland Estate Cabernet Franc shows similar precision. “I’m a bit of a soil geek,” said Ross Wise, the New Zealand-born winemaker at Flat Rock Cellars. It was an understatement. 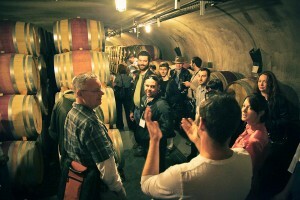 Wise had set up a “terroir test” for the TasteCamp writers, and he spoke expansively on his love for the dirt. His wines impressed, and he wasn’t the only Niagara winemaker obsessed with the land. Any developing region will come of age more quickly when its growers and winemakers gain an understanding of what the land provides. 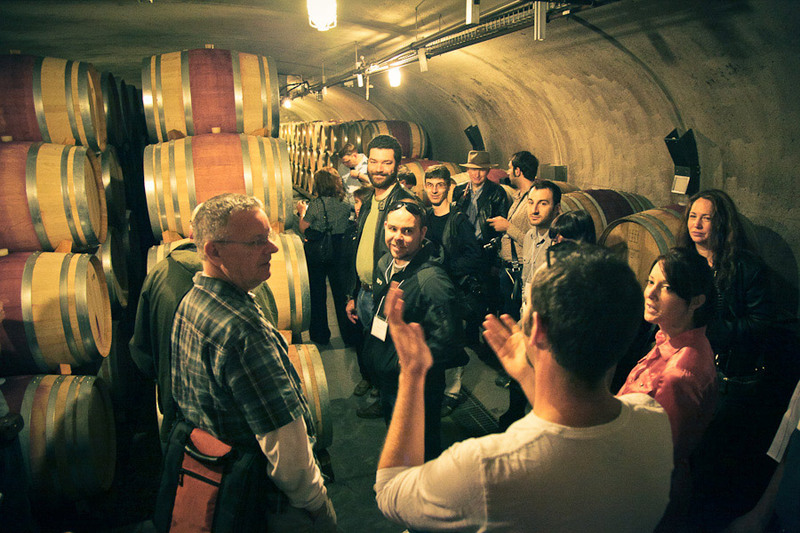 We met perhaps a dozen winemakers who could speak in depth about what was planted and why. They run soil tests and conduct comparative tastings, ripping out vines if they don’t succeed. Indeed. One Canadian writer told me that they’ve dubbed Tawse, a gorgeous, sprawling mutli-level building, the “Tawse Mahal.” Organizers explained that some of the most successful Toronto-area business leaders have launched wine companies in Niagara. It’s made for eye candy, easily on par with many of the most opulent Napa estates. It’s also a little bit sterile. At Tawse, Paul Pender’s drive shows up the wines, but the tasting room feels overly corporate and packaged. No doubt they’re not marketing to wine geek writers. 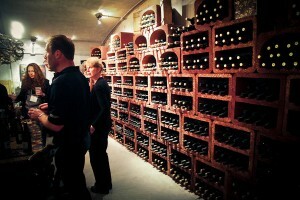 And certainly the many smaller wineries in Niagara might offer a different feel. I left Niagara stunned that I had known so little before the weekend events. A curtain had been raised. You won’t find many Niagara wines in the states, but there is a push to change that. Still, the best way to experience this impressive region is to visit. You’ll want to prepare for price variation. The excellent Tawse Pinots range from less than $30 to nearly $60. (The exchange rate won’t help you.) The Chateau des Charmes 2007 Equuleus is $40. Ed Madronich, the charismatic owner of Flat Rock Cellars, declares his intent to keep his wines at $30 or less. Then there are dozens of quality bottlings priced in the teens. There is an entire world of wine past the ostentatious Niagara Falls. I intend to return soon, and not because I’m in the market for ice wine. Photos in this article are courtesy of Suresh Doss, of Spotlight Toronto. 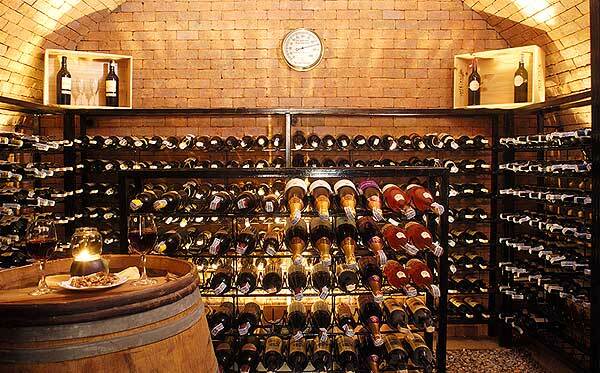 I’ve been through wineries in Europe, Australia and California, but I’ll never forge the wines form home. The wines I grew up on. Canada’s has other growing wine regions on the west coast and through Quebec that are also turning heads. http://bars-and-bartending.com/history-of-wine.html has tons of information for the newbies. Brush up on your wine lingo and knowledge and impress everyone at the next dinner party.